A Blast From The Past With A Modern Twist! Ping 1.5+ is an action puzzler developed by the indie studio Nami Tentou Mushi that is part Block Breaker, part puzzler, and has incredible arcade-style action filled gameplay that makes it a very unique title! The game uses the touch controls of the Wii U to control the block which is essentially the playable character in the game. You need to bounce the block off of objects to reach the goal. You only have a limited number of bounces to reach the goal before your block shatters and if you reach it within a small number of bounces you'll earn a silver or gold star for the stage! 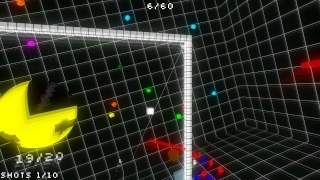 The game also has boss stages with a variety of unique rules such as destroying a certain number of asteroids without dying or defeating a boss within a certain number of bounces or shots which can be extremely tricky! The final boss in particular is brutal and is borderline impossible to beat unless you're really lucky, but as a result this game is far too difficult to complete 100%. 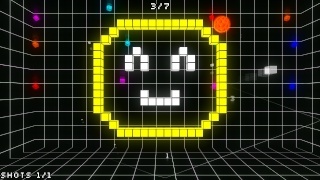 Ping 1.5+ features cameos from classic arcade titles from the 1970's and 1980's such as Space Invaders and Asteroids and even one of the bosses looks alot like Pacman which is quite interesting and really adds to the classic feel that this game possesses! The graphics of Ping 1.5+ are decidedly retro, while at the same time they have a superb shiny HD look to them that really pops and looks incredible! The 3D objects look great while the simple background gives the game the retro look that the developer was aiming for. The music is simple and fits the game well while the simplistic sound effects are reminiscent of 1970's arcade titles which will give retro gamers a feeling of nostalgia! The controls are simple and easy to learn while the Off-TV Play is a great feature for gamers that don't always have access to a TV! With great gameplay, excellent touch controls, and impressive retro audio-visual presentation Ping 1.5+ is a great game that any fan of action-puzzlers should download, however an extremely difficult final boss does make this game a chore to complete 100% and does hurt the overall score of the game, but we still give this game a high level of recommendation! Great review. I agree with the score it's a solid game! I like the arcade classics cameo's lol. Good review. Looks decent enough.